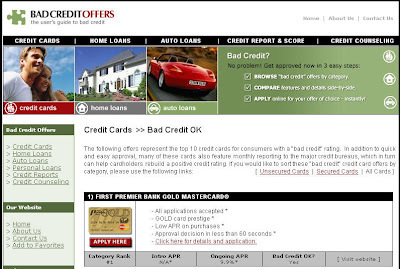 With all the easily available credit cards and loans, many of us are living with bad credit. I have to admit that mine is not perfect too but then whose is? I think the percentage is very small. In many cases, people with bad credit are not eligible for loans but all is not lost as there are still plenty of resources available and it is just a matter of finding the right one that meets our financial needs. This is where Bad Credit Offers come in. This is a informative site to help people look for bad credit offers whether they are for credit cards, home, personal or auto loans. Within each offer category, you will be able to compare the various bad credit offers by credit providers so that you can easily decide which is a better offer for you. As always, I would like to mention that when it comes to financial matters, you should read the fine print and understand 100% what you are committing yourself to. This entry was posted in Self-help on October 20, 2007 by Cyberpartygal.